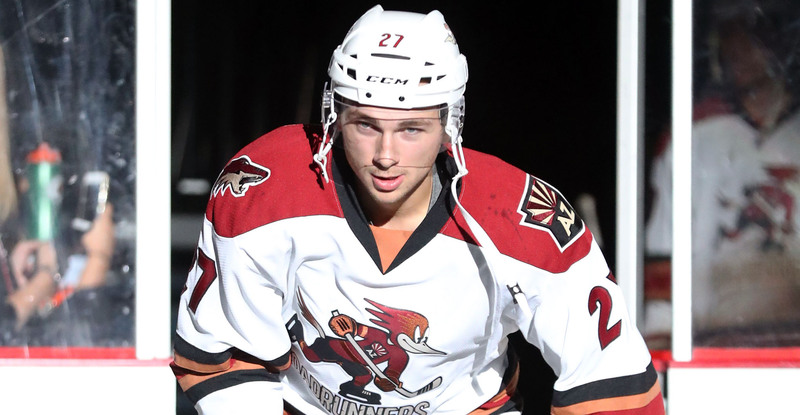 TUCSON, AZ – The Tucson Roadrunners, proud American Hockey League affiliate of the Arizona Coyotes, announced today the 24-man roster for Opening Night. The team includes two (2) goaltenders, eight (8) defenseman and 14 forwards. In net, Adin Hill and Hunter Miska combined for 41 of the team’s 42 wins last season. The two also had a combined six shutouts with four of them coming in the final month of the regular season. On defense, rookies Jordan Gross and Cam Dineen join a core also featuring former AHL All-Stars Robbie Russo and Kyle Capobianco. Both Trevor Murphy and Dakota Mermis made their NHL debuts last season for the Coyotes as well. The youthful forward group includes five first-year pros, four of whom averaged over a point-per-game in their final season of major junior hockey. Michael Bunting, the Roadrunners all-time leader in games played, goals scored and points, also returns for Tucson just one season after setting a new franchise record with 23 goals in a season. In total, 14 of the 24 players on the opening night roster played at least one game for the Roadrunners last season. 13 of the 24 players are National Hockey League draft selections.